The solution for integrating Microsoft Dynamics CRM with a phone system based on the Asterisk engine allowed MAXIMUM, an educational company, to improve the work efficiency of a large-scale call center. Communications with customers and partners have become more transparent, which gives the company’s management an opportunity to make necessary organizational decisions in a timely manner. The WaveAccess connector is used by 60 MAXIMUM specialists. MAXIMUM is an educational company that offers services in the field of preparations for standardized examinations along with career guidance services for secondary school and high school students all over Russia. For years, the company has been using Microsoft Dynamics CRM system together with the office IP telephony based on Asterisk. the company’s management were unable to fully analyze the results of the specialists’ work, track the call center load and assess the effectiveness of interaction with customers. MAXIMUM needed a single information space where all processes of communications with customers and partners would be extremely transparent, and routine operations would be minimized. the full call log is stored in the system: an incoming/outgoing call, call date and duration, with a link to the audio recording. MAXIMUM gained the ability to automatically record information on calls and efficiently manage its processing. Process automation made it possible to reduce routine operations when servicing incoming and outgoing calls and relieve the call center specialists of unnecessary actions. "We integrated the CRM philosophy into our business processes a long time ago, and the WaveAccess connector has become the last missing element in this structure. The project helps our call center cope more efficiently with the growing flow of requests without compromising the quality of communications. Since the WaveAccess solution was implemented, we have seen a significant increase in customer satisfaction and positive dynamics in the requests’ conversion rate," noted Tigran Baseyan, CPO of MAXIMUM. "Experience shows that in order to benefit most from using CRM, it is important to keep in mind the need to integrate the system with already existing business applications and services of the company. This helps get a complete solution where communication with customers is efficiently implemented in the organization’s key business processes. One of the major advantages of our solution for integrating CRM with PBX is a soft iterative setup that does not interrupt the employees’ duties. 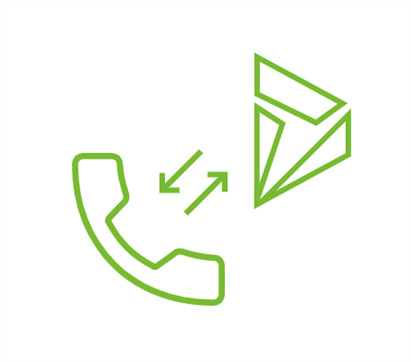 The connector can be implemented within 5 working days on average, the duration may vary depending on the type of telephony and nuances of the user process in the CRM system. The connector is applicable in both Microsoft Dynamics 365 (Online) and Microsoft Dynamics 365 (On-Premises), and suitable for businesses of any size," noted Ilya Feigin, founder and CTO at WaveAccess. One of WaveAccess' competencies is the development, customization and implementation of CRM systems — solutions based on Microsoft Dynamics CRM and fully customized solutions. The company also integrates Microsoft Dynamics CRM with various phone systems, including Asterisk, Elastix, Avaya. The WaveAccess solution for integrating telephony with CRM is also compatible with virtual PBXs. Would you like to discover how integrating PBX system with Microsoft Dynamics 365 can help you getting the most from every single call? Test Automation Tools for Desktop Applications. Pt.2: Open Source tools.